They’re our little four legged bundles of joy, but that doesn’t mean that puppies don’t still come with plenty of problems that need sorting out. You probably expected your puppy to have problems with having accidents in the house, but gnawing on you is another issue. Sometimes the issue is that you are letting your dog think that they are in charge, or your pack leader. Other puppies may only go after children, which is an entirely different problem but one we’ve also covered. All that said, your new friend biting at you during play or other times is not uncommon and doesn’t mean you’re a bad fur-parent, or that you have an unruly fur-child. It’s fairly normal, and thankfully easy corrected. So, read on to learn how to stop a puppy from biting! Make your puppy think he is hurting you when he bites you by letting out a puppy-like yelp. In doing this you are replicating the reaction mom or a littermate would have had if they were bit. Yelp loudly enough to briefly startle your puppy, then stop playing with him or her. If you yelp and don’t also stop playing with your puppy, they will begin to think that it’s a game. Ending playtime is as important as yelping in reaction to the bite. This will teach the puppy that if they bite, the fun ends. 2. Substitute with a toy. Give your puppy something to play with and bite on. When your puppy starts to bite on your hand during play time, remove your hand from their mouth and replace it with one of your puppy’s favorite dog toys, then continue playing. This shows your puppy that playtime is about playing with toys. If you hadn’t been playing with your puppy when he began biting you (maybe he bites your feet when you walk by) then give him a toy to chew on and leave him alone to play with it by himself. This helps teach your puppy that getting your attention by biting doesn’t work. It’s a great idea to have a variety of toys that have different textures for your puppy to choose from. Some puppies like plush toys while others like playing with KONG toys, chewing on bones, etc. Using an unappealing spray like bitter apple is one of the single best things to use for how to stop a puppy from biting. Keep the spray nearby at all times. If your puppy starts to bite spray the bitter apple on your hand, arm, leg, foot, or wherever he’s nipping at you. Then, let him bite at you again. Once he gets a taste of the spray he’ll start licking his lips and smacking his chops. Most puppies hate the taste of bitter apple and will stop biting immediately. Puppies rarely like the taste, but if your puppy does you can use a lemon essential oil instead. Both bitter apple and lemon essential oil will sting if they come in contact with an open wound from a previous bite, so apply with care. 4. Stand up and stand tall. When your puppy bites and nips at you it’s generally for two reasons, to practice dominance and to get your attention. Sometimes, simply ignoring this rude way of asking for attention will teach your puppy that if they do bite playtime is over. The next time your puppy starts to bite, stand up and ignore them until they calm down. Even if your puppy tries to get your attention by jumping or running around, stand tall until they completely relax and stop demanding your attention. 5. Give your puppy a command to stop biting. If your puppy instantly reaches for you again, remove your hand from their moth and say the command again. Timing is everything, so the second your puppy stops, give them a treat and praise them. Remember to never slap, hit, or yell at your puppy. Slapping or hitting will make your puppy shy away from your hands or might even make them think you are playing with them. Yelling escalates the problem by creating excitement. As you raise your pup into adulthood, you’re going to encounter more issues like these. Knowing exactly how to handle them properly will make your relationship with your pup full of love and fun rather than stress and headaches. 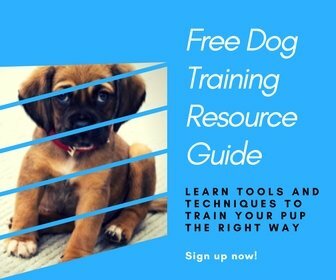 Renowned dog trainer Dan has an excellent video series which covers puppy biting as well as 250+ other subjects. He’ll take you with him as he raises his own puppy Moses into adulthood, showing you how to deal with everything that comes up along the way. If you’d like to learn how to handle these problems the right way, you can start watching his video series now for free by visiting his page. P.S. Please share this with fellow puppy owners by pinning! Thanks! !